Digital marketing is the way forward for businesses as they can reach potential customers through smartphones, tabs, and similar devices. The increasing numbers of mobile-only internet users far outnumber desktop users, so the shift to mobile-phone based marketing is an obvious choice. The time spent by people on the mobile phone is also far greater than the time spent on the desktop. As a business owner, you are likely to face the dilemma - should I go the way of the mobile app or the website. 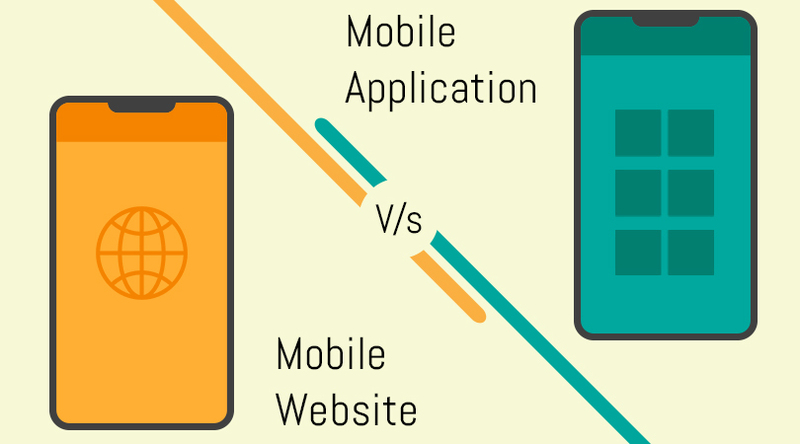 What Is the Difference Between Mobile App and Mobile Website? As the name suggests, both, mobile apps and mobile websites are accessible by mobile devices such as tabs or phones. A mobile website is a responsive website which is compatible with different operating systems like Android OS or iOS and easily adjusts to different screens as well as layouts. It has browser-based HTML pages which are interlinked. Just like with any other website you can view text, video, images, or data through mobile websites. There are features like click-to-call (dialling a phone number) or location-based mapping features (find a location) on a mobile website. A mobile app is a software which you can download and install on your mobile phone. Data and content from the internet can be accessed by it and can be downloaded without an internet connection through the respective app stores. What Are the Advantages of Mobile Apps? Mobile apps are platform specific like Android or iOS. They are installed on the phone itself. The programming language of an app, as well as an operating system of a device, is the same. It is an additional branding opportunity for users as an app and a website both are different entities. The app users get a totally different experience. Companies can try fresh branding strategies as well as styles with an app. If your website can't keep users engaged, then a mobile app can. Mobile apps can offer a customized experience to the user in terms of interests, usage, location, behaviour and so on. Users can set their preferences during the initial steps after downloading the app for the first time. By utilising the user's location, special promotions or deals can be provided by apps. An app can access different features of mobile devices like a camera, GPS, and so on. Through context and hyper-relevance, digital customers can identify exactly what they want. Mobile apps can access content without an internet connection and users have access at all times wherever they want. Mobile apps offer more interactive user engagement. Apps can make the same text and images on a website more interactive for users. Consequently, the users become more involved with the app and are more likely to become a customer. A mobile app becomes an integral part of the user's device, unlike websites. Their brand recall becomes stronger. What Are the Pros of a Mobile Website? A mobile website is a website that is personalized for mobile users and is created with a responsive design. You don't need to download the content onto Google Play on a mobile website unlike an app and this gives you a wider reach. Mobile websites can be accessed from all platforms. For multi-platform compatibility, a responsive mobile site is more economical than mobile app development. Sites which are mobile optimized rank higher when it comes to search engine results compared to sites which are not leading to higher traffic. Which Option Would Be Better for You? The choice between mobile websites or mobile apps would have a direct correlation with your business goals. If you want to provide content that is mobile friendly, then it is better to opt for a mobile website. However, if you would like to keep your customers engaged as well as interact with them in a better way; it would be wiser to choose a mobile app. There may be situations where you could use both to strategically improve your business prospects. Since mobile apps provide better user engagement and lead to customer conversions, you might be wondering 'How to Build a Mobile App'? Well, you need to find mobile app developers who have the right expertise as well as reputation. CS Web Solutions located in Mississauga, Canada are a professional web design as well as development company with more than a decade's experience and have the right expertise in web and SEO services as well as app development with clients all over the world. They are certainly strong players in the app development market. As a business owner, you need to understand whether a mobile app, mobile website or both will yield the best results for you.